So while I was writing my last post, I got an email from my hoop sista, eS-Bot. I wrote to her about where I was in my hooping life and after reading what she had to say, I called her. We talked for about an hour and the more I talked and voiced my thoughts out loud, the better I felt. She understands what I’m going through, offered advice based on her own experiences. I think I know what direction I need to steer myself toward. My energy, although well-intentioned, has been focused on things that have not served me and I need to move on and focus on things that fill me, not drain me. Thank you, my beloved hoop sister. Well, I actually got a part-time job doing what I used to do. Floor directing for a live show. I love it! Right now I can teach my morning and night classes and still work at the job. The income will go down because of more driving, downtown parking, montyly fees associated with my job. I still have unemployment for a while longer and I will receive some benefits to sort of make up the difference between what I make at my new job and what I used to make. whew! Good thing I worked crazy hours all those years! Of course, with new things, come new challenges. Balancing a mid-day job with morning and night classes, the commute, trying to drive less yet haul hoops and being away from home and keeping up with hoop biz related emails, web things, updating classes, etc. And right now my VW Bus is having major issues and I am hemorrhaging money between fixing her, paying rent on studios, etc. I’m at this crossroad – where to I put my energy? I had a complete meltdown as I was trying to leave to teach a class. Couldn’t find the keys that I just had in my hands not two minutes before. I was going to be late for class. Totally lost it, yelled, kicked over my cute little black leather foot stool (no damage! ), heaved a cookie sheet out the door (that felt good!) but I must’ve sounded like a crazed screech owl to my neighbors and I certainly scared my cats. WTF? That isn’t how I want to be as a person. But I just lost it! It seems like my energy is so closely tied to money – probably because I’m always on the verge of not quite being able to pay my bills. I’m forgoing many of the hooping events that I attended last year because of the lack of funds and knowing I need to rebuild my engine. But those are choices I had to make and it’s not like I can’t go next year. Maybe not being among all the other hoopers is what’s making me so unnerved. OK, so I love teaching, I love my students and want to keep doing it. Problem is that I don’t have enough students to cover the expense of running the classes. I assume that is typical when you’re starting out. I’m sort of paying money to teach. I know spring is coming and I can see that it is bringing out more hoop students. I feel I need to keep going until at least June. Maybe take a break over the summer (last summer was very slow for students) then push again in the fall. Not sure. I feel my personal practice has suffered tremendously because, frankly, I don’t make time for it. I’m teaching 5 classes a week and host a hoop jam. That’s a lot of being responsible for someone else’s hooping. Now back to the money. I barely make rent on the studios. I do teach two classes that pay well per hour and I don’t have to rent the space but they are very unreliable. I feel like I should step away from one because of poor communication within the community center (where I teach) and it reflects bad on my hoop biz. And the two spaces I rent for evening classes are not attracting students like I had hoped. But if I drop them, I will likely lose those spaces at those times indefinitely. So the question is here, who am I renting them for? Do I keep plugging along and hope that all my flyer passing, web postings, twittering, marketing (such as it is) will eventually get to my audience? What key element am I missing? If I give up my studio space only because of money, what would that say about me? That I’m a smart business woman who knows when to cut her losses? or a quitter? YIKES! So right now, I’m drowning in debt, am struggling with whether I should continue to teach, gaining weight through stress eating. Yep, my life is not balanced. Gotta do some more soul searching and path exploration. Well, the time has come for me to seek a bill paying job so I can follow my bliss as a hoop instructor and not lose my home. Times are tough for everyone and my work skills are stacked up in an industry that has automated me out of work. Hmmmm. What is a Hoopanista to do? My dream situation is working for a company that promotes a healthy lifestyle and outdoor adventure. 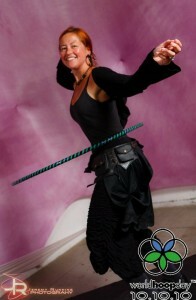 I would promote hooping as part of the healthy lifestyle that company promotes. I would lead groups on adventures involving hoops that I design and create! Perhaps travel to warm, beachy places? Central America? My job would be within walking/biking distance, allow me time off to attend hooping events and Burning Man. Students are beginning to find me and my heart is full of joy after each class. I’m worried about how to make a living at doing what I love. Bills still come in and the cash flow isn’t keeping up with the outflow. Do I find new places to teach? Teach more classes through Parks & Rec? Am I promoting myself the right way? What is it that I want to pursue? It is simultaneously exhilarating and terrifying…but that’s a good thing, right?! 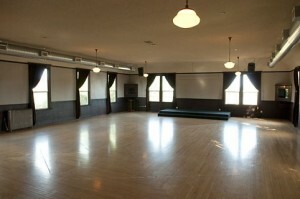 Wonderful hooping space in need of wonderful hoopers! So I felt I did the leg work but no one showed up to my first class last night. It is an incredible space, one with some sentimental attachments for sure. 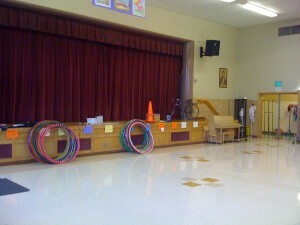 It’s the cafeteria/auditorium of my elementary school. Now I’m offering up some incentives so please spread the word! If you pay cash, you get $12 off a 6-series class. If you get 2 friends to sign up, I will make you a custom hoop! I can now use the registered trademark on my business name!!! REGISTRATION: To register, shoot me an email (click here for Contact page) and let me know which class(es) you would like to take, if you’re bringing a friend, etc. PAYMENT: PayPal should be up and running soon. I will also happily accept checks & cash (preferred!) on site. Woo Hoo(p)! REFUNDS: Class fees are non-refundable but can be transferred to another class series if space is available. Students must email HulaHoopla™ 7 days prior to the start of the class to be eligible for a transfer.